Next Next post: Thank you, FBD! Hi, I’m Cynthia! 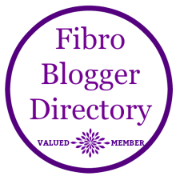 I write about life with fibromyalgia and things that inspire me to be the best me I can be. I tackle the challenge of my condition with healthy lifestyle choices and a positive attitude. I find joy in capturing a great picture, or finding a motivational quote. So what you’ll find here is a combination of all those things. Read more about me.